Life has been awfully busy lately–between rehearsals and performances of The Sound of Music with a bunch of 8-11 year old kids, readings of two brand-new musicals, and general “life stuff”, my baby blog has taken a back seat. But I’m on a quest right now . . . a quest to bring some new fresh, fabulous food into my life. You might be familiar with where I’m at: you (like me) love to cook – but you find yourself too busy to do so. And when you do muster the energy to cook, you cook the same 6 recipes every time. Well, I’m battling against that with a credo of “at LEAST one new recipe per week”. I can handle that–even at this state of busy-ness! One sublime summer day at the Getty Museum LA–perfect way to celebrate a girl’s 30th birthday. This recipe is adapted from one sublime meal I had at the Getty Museum in LA. The Getty is one of the most astoundingly gorgeous museums I have ever had the pleasure of perusing, and its restaurant is equally fabulous. If you find yourself in LA, please make the trek out to the canyon and take the tram ride up to the museum. It is SOOOOO worth it! I have a slight obsession with summer peaches (I think I actually ate approximately 100 of them while in Seattle for three weeks. The peaches in Seattle were that good.) So when I saw “grilled peach flatbread” on the lunch menu at the Getty, I was sold. And as I did with most of my favorite menu items on the road, I took down the listed ingredients on the menu so as to be able to duplicate this delicacy at home. So here is my “homemade” version of the Getty museum restaurant’s masterpiece. 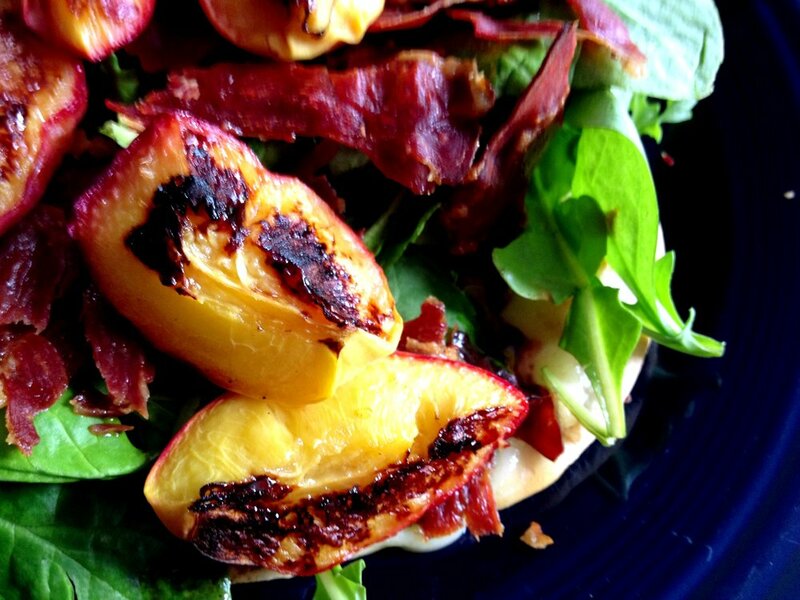 The salty, crispy prosciutto, the sweet, caramelized grilled peaches, the creamy brie, and the peppery arugula make for a REALLY special salad experience. YUM!! Preheat oven to 375 and line a baking sheet or two with parchment paper. Lay out your prosciutto strips in a single layer and crisp for 15 minutes in the oven, rotating the pan once halfway through. Remove from oven and let sit on the counter for a few minutes to get super crispy! (This step can be done a day or two in advance. Just store your crispy prosciutto in a sealed container on the counter.) Turn the heat on the oven up to 425. If you have a grilling pan, pre-heat it in the oven for 15 minutes or so (pre-heating the pan will give you that “grilled” effect as opposed to a longer, slower “roasted” effect). If not, a dutch oven or cast-iron skillet will do the trick. Slice your peaches into quarters and spray or brush with a bit of olive oil. Carefully remove the hot pan from the oven and place the peaches in. Grill for 4 minutes or so, then remove pan from oven and carefully turn peaches over. Grill an additional 4 minutes, until they are beautifully caramelized and smell approximately like heaven might smell if heaven were filled with peaches. Arrange your flatbread on your prosciutto baking sheet (’cause really, why get another pan dirty?) and arrange a couple slices of brie over it. Place in that 425 degree oven until the bread browns a bit and the cheese gets melty, approximately 8 minutes. While your bread is getting melty, whisk together 1 TB Balsamic Vinegar with 3 TB olive oil and a bit of salt and pepper. Toss your arugula and spinach mixture with the dressing (as much as you like). Crumble up the crispy prosciutto and mix that into the salad as well. When the bread comes out of the oven, top with prosciutto, arugula, and spinach mixture and top with your grilled peaches. Dress it up with a bit of fresh cracked pepper . . . goes GREAT with a glass of champagne!